Today I'm featuring Circling the Sun by Paula McLain, borrowed from the library. The Vega Gull is peacock blue with silver wings, more splendid than any bird I've known, and somehow mine to fly. She's called The Messenger, and has been designed and built with great care and skill to do what should be impossible—cross an ocean in one brave launch, thirty-six hundred miles of black chop and nothingness—and to take me with her. Page 56: "'He smelled like hot cotton, like the sky." My thoughts: Circling the Sun is the September read for one of my book clubs. It seemed a natural choice since we enjoyed McLain's previous novel, The Paris Wife. Over our seven-year history, we've read many fictional accounts of real-life relationships, and this genre has become one of our favorites. Our very first book selection, Loving Frank by Nancy Horan, likely set the stage for us. From Goodreads: Paula McLain, author of the phenomenal bestseller The Paris Wife, now returns with her keenly anticipated new novel, transporting readers to colonial Kenya in the 1920s. 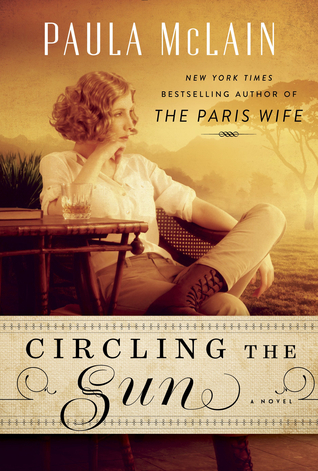 Circling the Sun brings to life a fearless and captivating woman—Beryl Markham, a record-setting aviator caught up in a passionate love triangle with safari hunter Denys Finch Hatton and Karen Blixen, who as Isak Dinesen wrote the classic memoir Out of Africa. Friday Focus: The Friday 56 & Book Beginnings #93 was originally published by Catherine for bookclublibrarian.com. This post cannot be republished without attribution. Retweeting and sharing on Google+ are encouraged and appreciated.